Did you know that standing is only good for you if it’s done properly? A growing number of people are rediscovering the healthy benefits of standing at work rather than sitting. 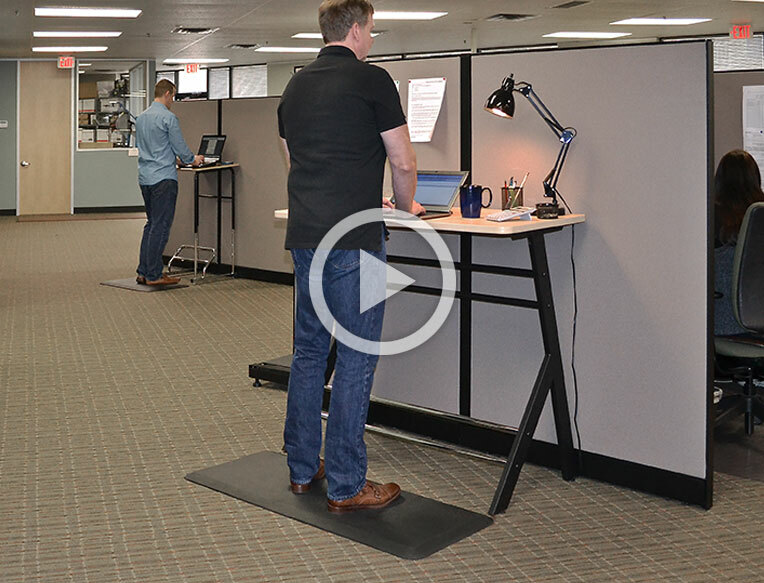 When done properly, standing has been proven to reduce the risk of diseases, burn more calories and increase your circulation which can keep you more alert and focused. Standing on hard flooring without the proper support can actually cause unnecessary discomfort, fatigue and even injury. Proudly made in the USA, NewLife Anti-fatigue Desk Floor Mats are a premium comfort solution constructed with energy-return, high-density polyurethane foam. 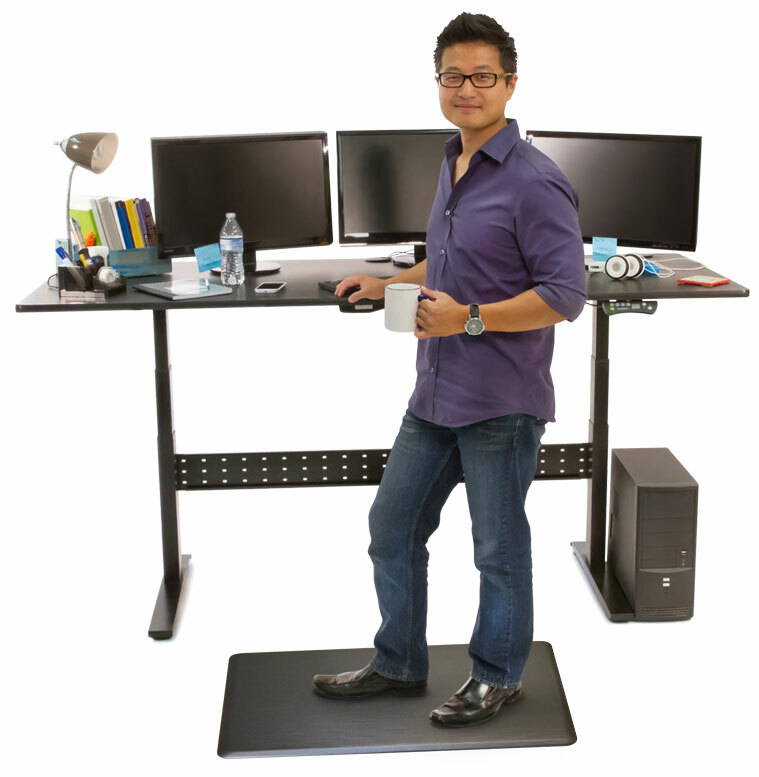 Standing desk mats by NewLife feature bounce-back memory and deep-cushioned support that feels so natural, you may actually forget you are standing while you work. 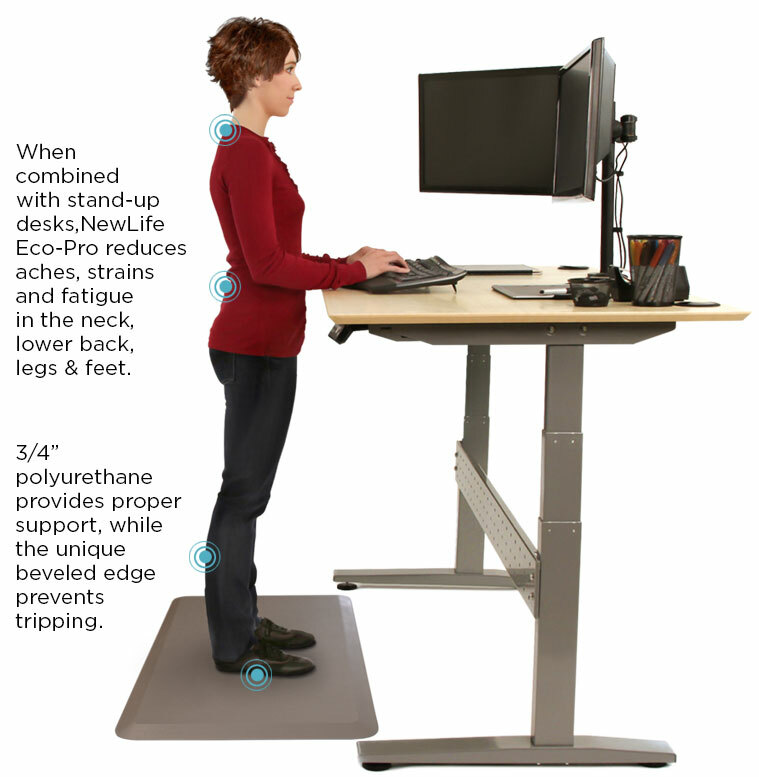 An ergonomic study winner, NewLife Eco-Pro Anti-Fatigue Desk Floor Mats are a premium comfort solution that makes standing while you work healthier than ever. 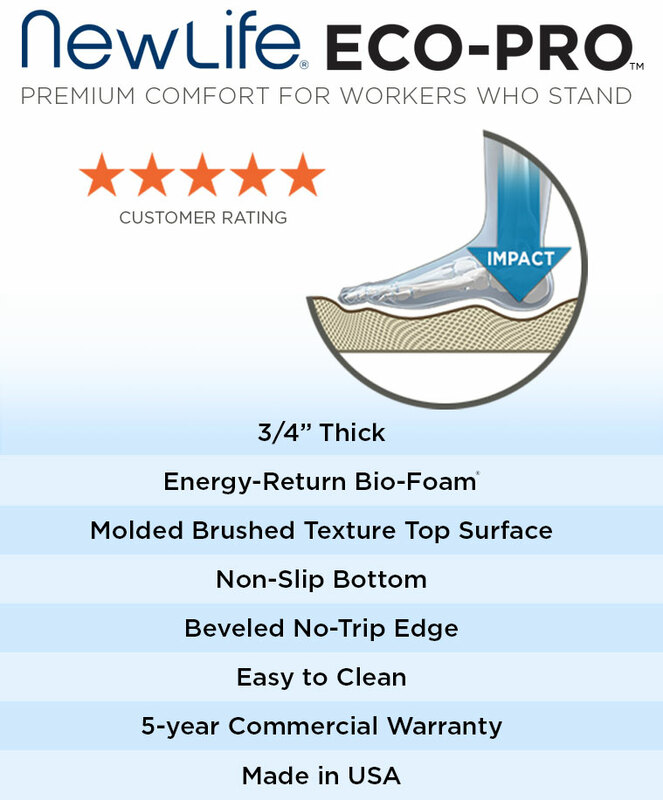 These durable comfort standing desk pads are constructed with eco-friendly, molded-polyurethane foam with bounce-back memory that restores energy and improves stamina According to a major university study, standing on a NewLife Eco-Pro standing desk mat reduces spinal compression and increases flexibility so you can stand at workstations without unnecessary discomfort and fatigue. NewLife Advantage Anti-Fatigue Floor Mat offers an affordable comfort solution for stand-up desks and workstations. 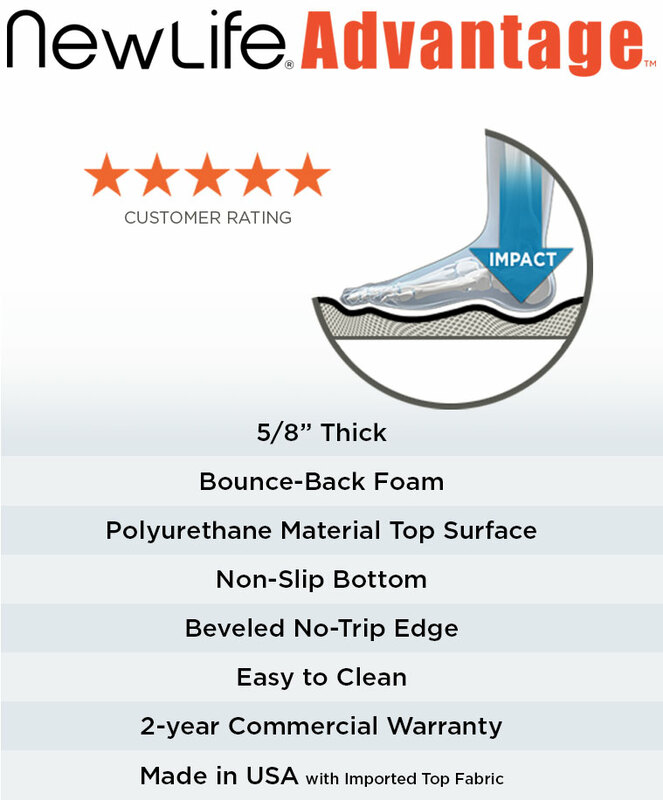 This commercial comfort stand-up desk mat is constructed with 5/8" thick ComfortCore™ polyurethane foam covered with a top layer of phthalate-free polyurethane material designed to stand up in busy workplaces. The NewLife Advantage Computer Desk Floor Mat provides proper ergonomic support while protecting your feet, legs and back from discomfort.